FG Trading recently took part in the Glass Expo Africa 2014 and we are pleased to report that the exhibition was once again a huge success. We were met with an exceptional response from the trade with over 300 visitors to our stand, hailing from various countries in Africa as well as abroad, and we look forward to expanding our existing client base. Our impressive stand spanned 144m2 and showcased our extensive range of products, which has more than doubled since the Glass Expo 2012 and continues to grow at a rapid pace. The products which were featured on our stand included sealant guns, glass cutters, sealants, adhesives, tapes, test equipment and instruments, glass handling equipment and our brand new range of glazing tools. Various top quality glass processing and aluminium machinery was also on display and two of our glass processing machines, the Neptun Rock 8 straight line edger and the GMS heated roller press, were fully operational allowing us to give potential buyers live demonstrations. Aside from members of our own staff, we were fortunate to have international representatives on hand from selected principal brands to provide expert advice as well as demonstrations of the various products, machinery and software. These representatives included Stuart Wakeham from Tremco illbruck, Ibrahim Issa from Quanex, Brian Gold from Jotika and Tanio Refano from Neptun. 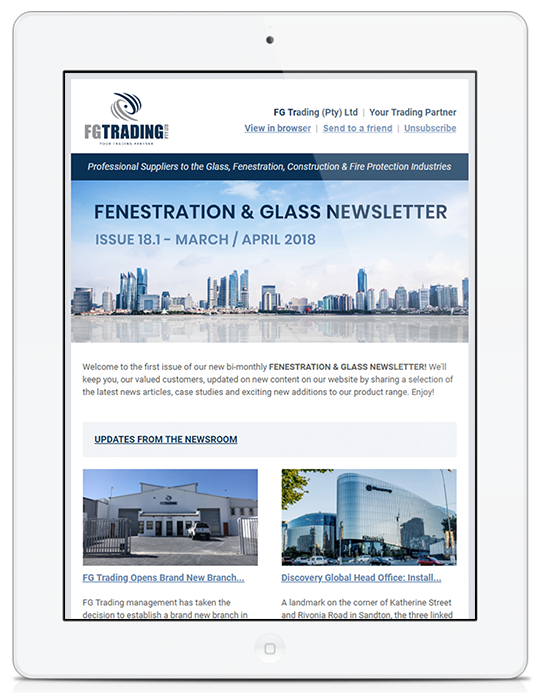 In addition to our participation in the Glass Expo, FG Trading also sponsored three international speakers, who are specialists in the glass and glazing industries, to share their vast knowledge and technical expertise at a one day conference jointly organised by FG Trading and AAAMSA. Richard Gulliver, Tracy Rogers and Dr Leon Jacobs were able to provide industry professionals with valuable information and insight on worldwide trends and developments regarding sustainability in the building envelope at this prestigious event. We would like to extend our gratitude to our staff, international visitors, speakers and representatives, the team at Specialised Exhibitions, AAAMSA, our stand designer, Progroup and everyone else who contributed toward making the exhibition and the conference a great success.